Xenoestrogens: What are they and why you should be concerned. Xeno-estrogens are foreign or artificial estrogens made by man and not naturally found in the environment. Why are they a concern? Xenoestrogens are taken into our bodies and cause an abnormal, strong, and unhealthy response. I like to use the analogy of a shout vs. a whisper. Naturally, our bodies make the hormone estrogen, uses it, and clears it from the body. Our natural occurring estrogens need only to use quiet (cell to cell) communication to get the delicate jobs done in the body like building the uterine lining in preparation for fertilization. Artificial estrogens, like pthalates (chemicals that make plastic soft), are the loud mouths in the body, boisterous and rude. Xenoestrogens are the SHOUTS, cellularly speaking, they are the "get up and move it" drill sergeants. In other words, If your diet contains Xenoestrogens, then your estrogen receptors, located on the surface of cells, are being bombarded with shouts and demands, instead of gentle nudges and whispers. Think gorilla vs. a lamb. Who would you rather be in a cage with? Simply stated, Xenoestrogens are harmful because they can keep the estrogen receptors on the cell surface TOO ACTIVATED. What health problems does this cause? Uterine Fibroids, FBD (fibroids in the breast), and most harmful is activation of cancer in hormone rich tissue like the uterus and breast. Want to learn more? The attached article goes into more detail about the sources of Xenoestrogens and how they affect the body. Q: I have suffered with seasonal allergies for years, but now it seems I have them all year round. What can I do to start living allergy-free? 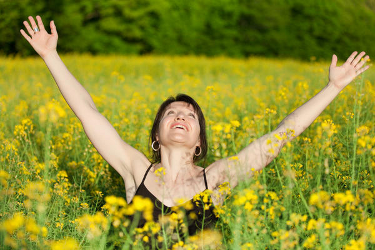 A: If you are experiencing chronic allergies, maybe it's time to get to the root of the problem and be like the woman in this picture....allergy free and happy about it. If allergies were completely due to the increase in pollen count we would all be sneezing and teary eyed every spring. Yes, the environment can be one cause, but rarely the only one. Why do some individuals remain allergy free every year, while others suffer through it or suppress symptoms with medication. The answer lies in you - within your internal environment. The analogy may be used of a test tube in a chemistry lab. If you choose to mix chemicals that cause a strong reaction, smoke will be the end result. On the contrary, If you mix chemicals that are neutralizing, a milder reaction occurs. The same philosophy can be applied to the blood. Certain foods, drinks, emotions, lifestyle habits, and/or the environment cause the release of inflammatory chemicals in the blood or not. Some foods and lifestyle habits are inflammatory by their very nature like sugar, alcohol, unhealthy stress response, and smoking. The end result of a disease promoting diet and lifestyle is a greater increase in chemicals of inflammation (i.e. histamine, leukotrienes, some prostaglandins). Thus, higher levels if these chemicals results in chronic inflammation. Chronic inflammation leads to immune system imbalance and increased susceptibility to outdoor allergies. High levels of inflammatory chemicals result in a hyper responsive immune system. The environment may be the last straw that tips the bio-inflammatory scales and thus, the scapegoat. Every body is different. For example, tomato, tuna, and cat dander may trigger allergy symptoms in one person and not another. Symptomatic reactions to food are often not immediate and therefore unidentified and unadressed. The Standard American Diet (appropriately termed "SAD") is nutrient deficient and often toxic. Foods that are not certified Organic only require three soil nutrients to grow: Nitrogen, Phosphorus, and Potassium. 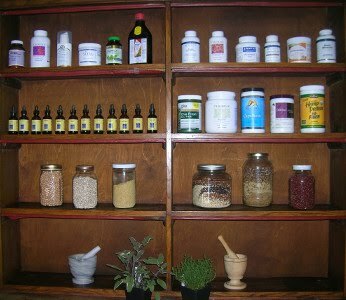 The body needs over 70 nutrients for optimal health and disease prevention. The SAD lacks essential nutrients to repair organ systems and tissues (e.g. immune system). Switching to organic foods is a necessary first step toward your path to health. Finally, start with identifying and removing the obstacles to cure in your life. Begin by eliminating junk food, fast food, sodas and other unhealthy "foods". Eliminate foods you suspect are problematic. If you are not certain, begin with removing gluten grains and cow dairy for at least four weeks. Choose organic whole foods in their natural state. Most folks are chronically dehydrated and this will worsen allergy symptoms. Increasing your intake of water dilutes high levels of inflammatory chemicals. Drink half of your body weight in ounces of water every day. Naturopathic Doctors are experts in nutrition and can help uncover your allergic triggers and create the optimal diet and lifestyle plan for an allergy-free you. Click here for information on the best test to determine which foods you should avoid.